"I want your fear. For your fear, like a current, rushes through your body. Your fear makes your heart pound, it renders your veins rich and full." 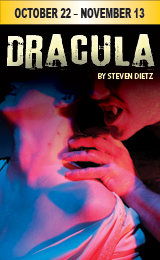 Rich with both humor and horror, this new adaptation restores the suspense and seduction of Bram Stoker's classic novel. As Count Dracula begins to exert his will upon the residents of London, they try to piece together the clues of his appearances. Earlier this month, we had a very successful night out on the town in Frederick for First Saturday. People were very receptive and seemed to enjoy playing along with Miss Mina and Dracula himself. Opening night is fast approaching and I'm looking forward to experimenting with effects, props, and the set for the upcoming tech week. Tickets: Adults ($23.50), Students/Seniors ($20.50), "First Friday" (All Seats $5 on 10/22 ONLY*), Thursday & Sunday Evenings (All seats $16.50). Ticket price includes a $1.50 handling charge. *$5 Preview tickets are only available at the box office one hour before the performance and are CASH ONLY!